Apply Indian Railways Jobs For 18000 Post – Indian Railways has released the vacancies of approximately 18000 post to be filled immediately. These vacancies are for different post and qualification which include Commercial apprentice, Traffic Apprentice, Goods guard, Traffic Assistant etc. 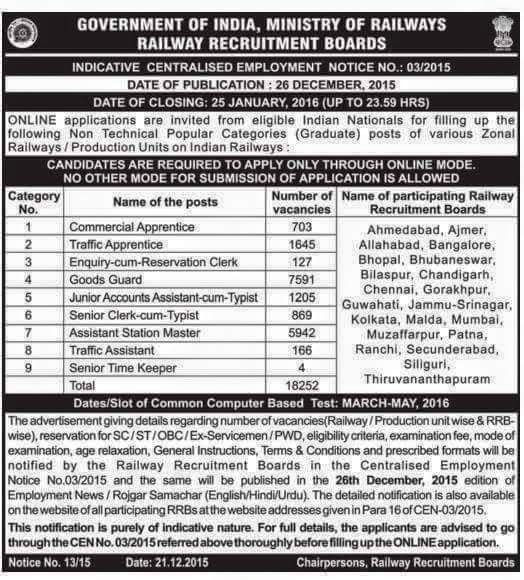 Indian Railways has clarified that all the application against these vacancies will be filled online.The Details will be published in the employment news of 26th December 2015. These vacancies are to be distributed against 21 different RRB zones. Online application will be open to apply between 26-12-2015 to 25-01-2016.First time in the history of Indian Railways the Online Examination will be conducted in the month of April or May 2016. This is to remember that this year onward there will not be any interview for the post. based on the written marks the merit list will be prepared.